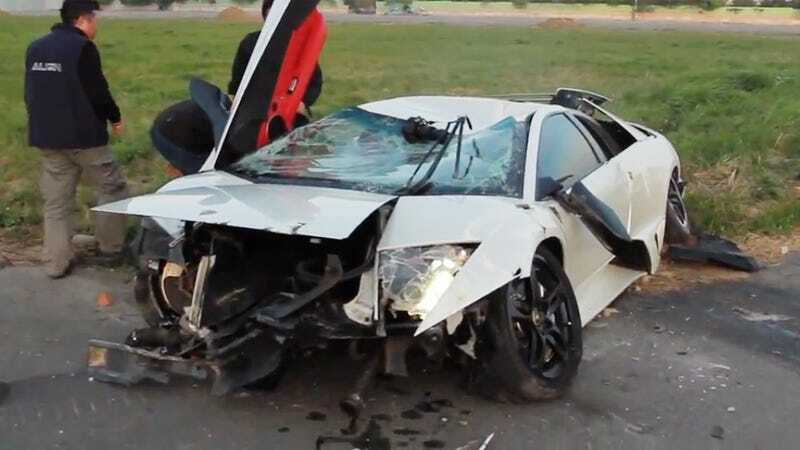 After finishing a race with an R/C helicopter and a Suzuki GSX-R1000, the driver of this Lamborghini Murcielago LP640 went off the road and crashed. That's a bad way to wrap a day of shooting. The airstrip dash was done for a promotional video for Align, the Taiwanese company that manufactures the featured T-Rex 800 helicopter. GT Spirit points out that it appears as if there were no casualties, though it looks like the car ended up on its roof. This crash, along with the Hennessey Venom GT that ran off the road a few weeks ago, shows that driving at high speed down a runway isn't as easy as you'd imagine.